Living the Dream | 2P START! Ray’s secret project is revealed! Funny that last week’s 11-panel comic was outdone by a 14-panel comic this week! Although Ray didn’t have to draw those panels, he’ll probably tell you that it still took some time and creativity to set those screenshots up, not to mention the time to actually create the Toon Ray texture for Lucas. Be sure to check out next week’s podcast for the full scoop! Toon Ray is definitly in the top tier. He would be ridiculously unbalanced and could not be eliminated. Some of his special moves would include using Jessica like Peach uses Toad, Using his “Tingle” form to float upwards to avoid death (which would not happen anyways), and bashing other characters with his knubby elbows! Panels 5-9 are my fav by far. 2P Fire is the greatest move ever. Also, return of the Smash Eyes! Cool Comic Guys, really made me laugh oh wait I mean CCG! You know, I sent you an email when you mentioned this requesting instructions…. I don’t know where to be bummed that you did this by yourself, or outraged that I didn’t skin Snake with Sega paraphenalia (actually, stratch that, the rocket launcher now has a dreamcast on it… so far). Oh well… good comic though. Insta-download! Adding the CSP too. >:) Good job Ray, I’ll patiently (hoping) waiting for a Tim one. Just for TEH ALL OWT BRAWL! Awesome comic! It was kind of long, but definitely worth it! I’m tempted to download you (as weird as that sounds…), but I don’t feel like hacking my Wii in any way. And where did you all of a sudden get that Final Smash from in the last panel? omg, ray that mustve been fun! that a seriously funny comic! Ok, everytime I come back I see something new, and since i’m supposed to be studying, I’m obviously spending my time surfing the site! Duh! Anyways, in the second panel Toon Ray looks like he was just rickrolled’ or that he’s nausous. You forgot the knubby elbows…-_-. Now we need An edit of Ness to be Tim and we got everything! I like what you did to Sonic… He deserved it. I just hope that the next ten years will either kill him off entirely, or he gets good games. After years of disappointment, Ray determines that the only way to stop the endless parade of new Sonic friends is by becoming one himself. Godspeed friend. May you end the madness and prevail as the next… Game Master. Skinning games is soooo fun, It’s why I typically pick PC games over console games. It’s what really got me going in figuring out how to work Photoshop. And now you’ve unleashed this unto your Wii. Have fun, Ray! great comic! I was really confused the first half, but my brain started and it was awesome! I love how Ray gets back at Sonic! Smash him for all of us Ray. I’ve heard you guys discuss the enhanced camera mode hack quite a bit already, but it’s really something to see it in action. Wow. Smash Bros. was just prefected. Man, if Ray got distracted working on the Facebook comic, I can’t imagine how distracted he got for this one. Curse you, CKcheeseboy…. way to just steal one of the lines I was waiting to use for the podcast…..
Yeah, it looks like he peed himself right as he did the kick! So are we going to see Ray or Miley? Or a texture hack of the pictochat stage into a Photoshop stage with a comic being worked on in the background. So are we going to see Ray Tim or Miley? That comic was really, really good. Wasn’t expecting “Toon Ray” for a second and consequently did a real life spit-take when I saw that second panel. Well done, indeed. Only one thing missing… a Toon Tim assist trophy. Visually interesting but the jokes lack punch (pun not intended). I’d say it’s about time for a few weeks of comics without Sonic. Come on guys, really now, Sonic hasn’t been sucking since 1999, just 2003 when they decided to screw with the formula and listen to a bunch of five year old children, rather than stick with the formula and make these kids know what sonic is really about. I said 10 years for the sake of generality and readability. Personally, I would say Sonic Heroes was the first indicator of a downward trend. I’d say Shadow started the downward trend. I liked Heroes, though my opinion may change as I’m about to play the game for the first time since it came out. Anyway, cool comic. Not so much a funny haha comic (though there were a few chuckles) but again, it was like a giant inside joke comic for us regulars. Who needs premium content when you have comics like this (though keep the premium content…I like it. XD)? Oh… My…. Gosh. This is just epic to no extent. The only thing that could be added to that texture were knubby elbows. Now I really wish I had a Wii. Just one last thing to say… OH MY GOSH! SONIC! I AM YOUR ABSOLUTE BIGGEST FAN! I mean id be able 2 download ray…. wow that has to be one of the most disgusting things Ive ever said!!!!!! I think Heroes is underrated, I feel Shadow was the start of the decline. I’ll admit, When “TOON RAY” met Sonic I laughed so hard coffee came out of my nose. It’s great to see an inside joke once and a while. BTW, Ray owes me a new shirt!!! wow way to make me regret selling brawl for a DS lite O_o and I know sonic is bad lately (May Black knight BURN!) but do ya really gotta castrate him for adventures 1, 2, Rush, and unleashed!? I get the others 😐 AND BARE HANDED NO LESS! Ok, I cannot for the life of me figure out how to download the textures from Stack Smash. To be more precise, I can’t find any links to download the textures. Any advice? Woah! This is so cool, Ray! Next can you make a texture for Lace? Woah, a texture for lace would be awesome. She could take on… Zero Suit Samus? Why not make a Toon Tim texture? It could overwrite Ness and you could make sound to go along with it! What could the taunts be though? You’ve crossed the line never meant to be crossed; inserting yourself into a favorite game to screw around. Holy crap. I really mean HOLY CRAP. An extra comic for this week? MAN! You guys seem to outdo yourselves every week. I’ve all but stopped listening to music while on the way to work, because listening to your podcasts (and some others) is more enjoyable. I suppose it’s like having a good conversation even when I’m alone. Great job guys, BIG UPS! this is probably the coolest thing I’ve ever seen. Wish I had a wii so I could play as toon ray. Ray/Tim, we at Stack Smash are big fans of your comic. I didn’t see this coming. Totally agree with Tacos because its name is Tacos. Well make it obvious because giving us OUR webcomic is not enough. Also Ray really is having a adventurous time while Tim is lonely with his big money pool and real friends. Ok, so I recommended this site to a friend and he said that the dancing with the “star” panel was the funniest. Just passing on the news. BTW, what is that behind Ray in panel 13? http://www.youtube.com/watch?v=CcrtkiLEGbE <- What I’m referring to. As far as I’m concerned, I say Sonic was screwed the moment they put Iizuka in charge. He was the director of Sonic Adventure 1, Adventure 2, Heroes, and Shadow, and each was worse than the last. Yes, we need more Lace. Hey Ray! Press “A” to castrate Sonic! Lifeguard skills? You look like you’re getting ready to dive! Every REAL lifeguard knows you’re supposed to do a compact jump. Or have you forgotten? This is friggin’ awesome!! 2P FIRE !!! Well, just two little things. I can’t be the only one who saw it, right? honestly, I never thought about it being anything other then Ray beating up Sonic, usually, my mind goes straight to the gutter, but in this case I just assumed sonic was gonna getta hurt real bad! Ok, I have a major issue with the commentors and publishers of this site. Up till now I have allowed a certain attrocity and prejudice to go unchallenged. Even our beloved Tim and Ray are participating in this vile behaviour weekly. It almost makes you want to sing the mario underground theme. for those of you who do not realize this blatent and very upsetting trand, it is the continued use of the “press A” joke. While I agree that this joke is funny it discriminates against all the other important buttons on the controller, how come nobody is saying “press b to castrate Sonic” Remember be kind to your fellow buttons, they have feelings too. Press “B+X+Y+Up” to Jump! Press “A+B+Down” to Crouch! Press “Start+Select+Z+L+R” to Pause! This is what happens when the buttons on your controller form a union. Do what you must to stop them, so you can still simply Press “A” to Jump! This message brought to you by GOBAD (Gamers Opposing Buttons Against Discrimination). Please stop the needless torture of acronyms!!! Ray has a fetish with Sonic which sees behond the latest titles (which if it did- yeah). Simply put is starting to make this comic each week “yay another sonic comic”. Acronyms need to be brought out from behind the shadows and rise to power. This is the position of Acronyms Seeking Support. So, while on the topic of Sonic, I’ve been playing Sonic Heroes, and they give the characters’ ages in the instruction booklet. Am I the only one that finds it odd, that Rouge, the professional treasure hunter and trusted agent of GUN is only 17? I mean I knew they were relatively young…but 17? Seriously!? Also, as Team Dark, it’s apparently supposed to be harder…this seems to be achieved by throwing in random pits and frustrating sequences. I find myself muttering to myself, “Whoever designed this stage should be shot…” quite often. XD Oddly though I’m enjoying the game, it’s nice actually being able to play as Rouge outside of SA2 (as I haven’t really gotten the chance in anything other than Battle). Also is it just me or are the speed characters pretty pointless? Maybe it’s the difficulty of Team Dark and my…some would call it, obsession for Rouge, but I find myself constantly being Rouge because if I find myself suddenly dropping off a cliff the game was so kind not to show me, I can fly back to safety…and once Rouge is at level 2, she can destroy the majority of the enemies from a safe distance…including airborne enemies. Omega comes in handy sometimes, but Shadow is only used when I specifically need him. But anyway, Heroes is pretty decent. SA2 is better, but I’m enjoying Heroes. Though I’m not looking forward to getting all those Chaos Emeralds. how come nobody is saying “press b to castrate Sonic” Remember be kind to your fellow buttons, they have feelings too. What was wrong with grinding? The only problem with it was in the final levels in which sometimes they’d just end, but that wasn’t a huge issue. And last time I checked, most Sonic games have bottomless pits…in fact most platformers do. And I’m not sure I get the overly linear levels thing. Again, it’s a platformer, it’s supposed to be linear. And care to tell me how Rouge’s and Knuckle’s stages were linear? Also, I would’ve much preferred the whole Light and Dark thing (not just because of Rouge) because if they had just made the Hero story longer it wouldn’t have been as interesting. Playing as different characters with different motives added something. Plus SA2 had Chao. I might be able to go with Heroes starting the downward trend, but I don’t see how SA2 was. yeah, noooo Sonic Heroes (and I’m talking Gamecube verison only here) was NOT a bad game (despite the fact that Amy teamed up with Big). Sonic Heroes had alot of elements borrowed from past Genesis console games, and had they took the formula and polished it, we wouldn’t have had any of the “less-than-pleasant” Sonic games, like Shadow, perhaps? Sonic’s Ultimate Genesis Collection – shame on you Sega! Mario & Sonic @ Olympics – Shame on you, Miyamoto! Like I said, It was a good game, but you can see some of the factors that plague future games start here. Cancer starts out very small, but if it is left alone it becomes a big problem. OK I’ve got no problem with acronyms. Just when people make up random ones that nobody gets. Ok so the whole Sonic thing, I can’t say I was ever a Sonic Fanboy, but I usually enjoyed them. I like SA2, Sonic Adventure DX, and Sonic Rush. Didn’t play Sonic Riders cause it seemed like a bad idea. My biggest issue wiith games in general is controls. I hated Sonic and the secret Rings cause of control, but if they had had controls similar to SA2 it would have been great. Persona;;y, I just don’t know why people are all upset about games where Sonic isn’t the only playable character. I thought SA2 was perhaps the best (although it had too many Eggman stages). I think that in genreal a little bit of imxing it up is good. I appreciate the want for a “classic” Sonic game, but I mean come on, is change so bad. I really don’t feel that Sonic has been bad over the last 10 or whatever years, just different. Unleased was good, SA 2 was good, Sonic Rush was Good, even Heroes was ok, so let’s not hate Sonic for trying something new. Maybe I just don’t like speed runs, but looking back I really don’t enjoy the “classic” games as much, I would personally much rather have a SA 3 in the style of SA 2, then 30 “sonic” levels from Unleashed. With a name like Zero Quality, is it really any surprise? I completely agree. And let’s throw out the lives system while we’re at it. I don’t think this counts as me rising from my grave, as I had one comment before the segment was introduced, but this comic has made me want to comment. I loved Syntax Error’s texture hacks before they got closed down. 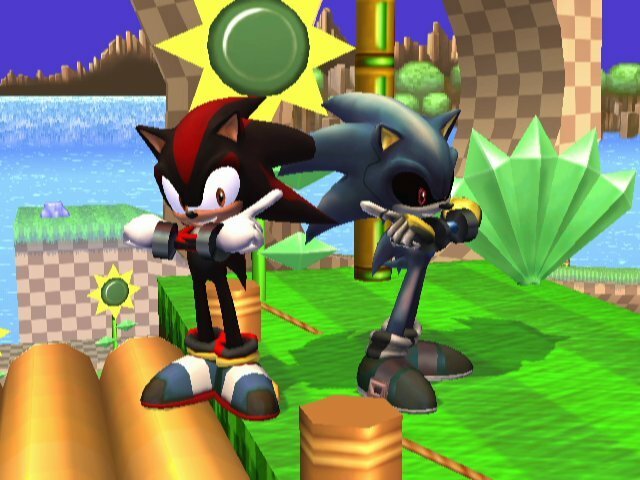 Especially Shadow & Metal Sonic. Nice comic that reminded me about texture hacking, I’m going to have to get in to it. This is my first comment here and I’m actually first XD. Now we need Toon Tim on Ness! Woah, I just noticed the Obama’s Raybob Industries logo on the shirt. Very nice touch. I see what you did there. Nice subtle joke there. BTW…I like the little touch with the shoes Ray. I guess every crazy fan needs a pair of friction-free shows. Dude. This comic is epic! I especially like the face-off with Pikachu. Totally my favourite panel of the entire comic! Keep it kicking. Whens the part where you kill your brother? I can imagine Tim as a smelly nice guy with a limp.